On twitter last week, I was asked to recommend some Margaret Atwood books to a friend. A daunting challenge because as soon as you name one of her stellar offerings; you instantly start thinking of another that’s just as good! Requiring a slight respite from all of my Southern Vampire Mysteries (Blood-A-Thon) which – though fun – have become a little repetitive of late; I decided to quickly dip into one of my very favourites – The Penelopiad. Released in 2005, this was one of a number of contemporary retellings of classic tales for the Canongate Myth Series. This international project aims to recruit the most vivid storytellers of the day to each recreate a particular story- with their own unique spin. So far authors as varied as Philip Pullman, Alexander McCall-Smith, Michel Faber and A.S. Byatt have contributed – though I have yet to try out any of their offerings. New challenge there I guess! The Penelopiad takes on the myth of Odysseus’ wife Penelope. She has long been regarded as the most faithful and devoted of wives, in contrast with characters such as Helen – considered beautiful but inadvertently (depending on the reading!) destructive. As with many female characters in mythology, Penelope’s narrative seems determined by the role she plays in relation to her husband. Within the original myth however, there are a few unusual and disturbing factors that were never fleshed out satisfyingly – particularly relating to twelve of her hand maids, who are put to death by Odysseus upon his return. The Odyssey is one of two epic poems written by Homer. It is chronologically set after the Trojan war and focuses on the ten year journey home of Odysseus (Ulysses) to the island of Ithaca. While he is travelling, his wife Penelope is left to manage the island. Odysseus is presumed dead and his wife and son – Telemachus – are forced to deal with the Mnesteres – 108 vying suitors for Penelope’s hand in marriage. Unaware that Odysseus has returned to the island; Penelope devises a test for the suitors, who have at this point become openly threatening and violent. Only the man who can string Odysseus huge bow and shoot an arrow through a dozen axe heads is worthy of taking her husbands place. Suitor after suitor fail at the task. Only the disguised Odysseus is victorious. He then immediately turns on the suitors and – with the assistance of his son and two faithful servants – cuts them down. As part of his cleanup operation he then hangs twelve of Penelope’s hand maids for betraying the household by sleeping with some of the suitors before finally revealing himself to a distrustful and hesitant Penelope. Only after describing their marital bed to her does she believe that her husband has truly returned home. 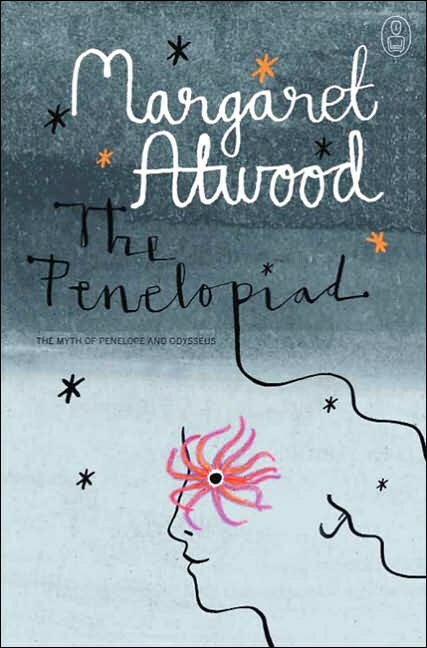 Margaret Atwood’s novella explores Penelope’s life through her own eyes – from her childhood, her relationship with the coquettish Helen, to her marriage, her life without Odysseus and even her afterlife in Hades. As Penelope’s narrator; Margaret Atwood presents life on Ithaca in a detailed and human way. She also presents the actions and motivations of the hand maids which I won’t divulge here as it’s a pretty major spoiler, but it places a fascinating spin on the whole tale! Between each chapter, the twelve handmaids murdered by Odysseus provide a choral commentary – discussing various topics from their perspective. Each of their interludes are articulated in a different way – a lament, a skipping rope rhyme, a folk song and a court trial amongst them. For me, some of these devices were more successful than others; but it was an excellent tool for allowing them to voice their regrets, fears and opinions with a group voice that remained fresh and vibrant. As is typical of an Atwood heroine; Penelope is intelligent, determined and honest throughout the tale. She admits her faults and mistakes readily enough and becomes so much more than a mere lesson in patience and fidelity. I can’t recommend this book highly enough. Then again, I can’t recommend any of Margaret Atwood’s writings highly enough! I absolutely loved this book; I found her take on the story very interesting. At the time I was doing a project on Helen of Troy and Atwood's portrayal is very different from a lot of modern stories which include Helen as the romantic heroine. I like this Helen better, I think. The twist with the maids was very thought-provoking, but if you look back at the original Homer then there are hints there; I love when books can create that link between them and make you think about the first one you read in a different light. I wasn't aware that it was a part of a series; I'll definitely be checking them out!